This article is about the character. For the guest star, see Gore Vidal. "Hah! These are my only friends: grown-up nerds like Gore Vidal, and even he's kissed more boys than I ever will." 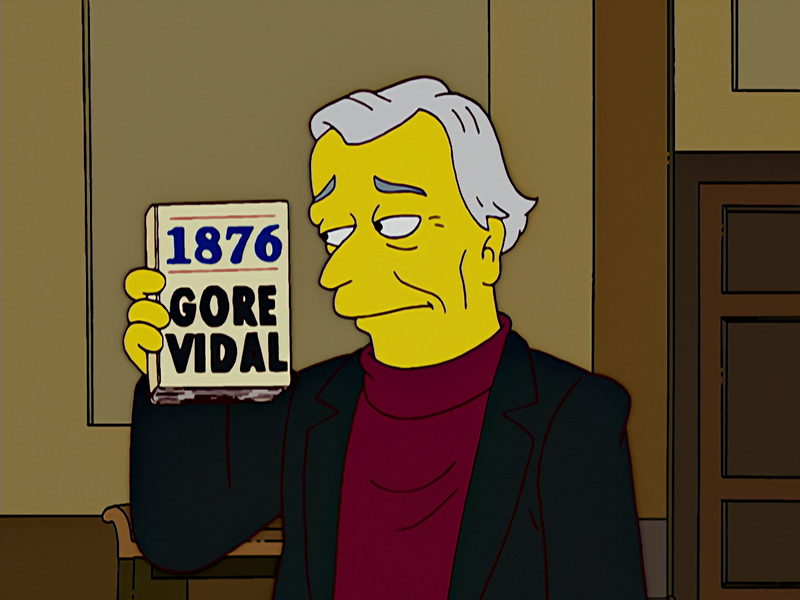 Gore Vidal is an American author. When Bart suspected Krusty was framed in the robbery of the Kwik-E-Mart, he confronted Sideshow Bob with the question of why Krusty would be seen on the store's security tape reading The Springfield Review of Books when he was illiterate. Bob said that one didn't need to be able to read to enjoy the magazine because it had amusing caricatures of Gore Vidal and Susan Sontag. Bart told him that he guessed he was right. When Marge asked Lisa which friend she would like to take to Ned Flanders' beach house, Lisa replied that her only friends were grown-up nerds like Gore Vidal. She then went on to lament that even Vidal had kissed more boys than she ever would. At the Wordloaf Literary Conference, Vidal said that he needed help with writing the book names 1876 and Burr, and that he saw them written elsewhere. He was then asked to pick up his gift bag and leave. In real life, Vidal considered himself bisexual. Modified on August 16, 2018, at 23:49.